1. How should I prepare the hole for the Redi-Footing? Try not to dig below the required depth. Make sure the bottom of the hole is firm, well-compacted, level and free of large stones. Bury RediFooting to the base of the cap (the PVC should be completely covered). The complete (and very easy) instructions can be found here. 2. Should I fill the 4 inch PVC pipe with concrete or something to make it stronger? No! Do NOT fill the pipe with cement. 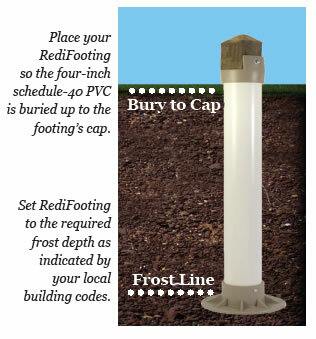 Redi-Footing has been thoroughly tested (see documentation for testing results) and the PVC, Cap, and Base properly assembled with pins is all that is required. Redi-Footing is stronger than concrete. Filling the pipe or otherwise modifying the design will void any warranty. 3. Should I backfill the hole with gravel or just dirt? Use the soil you dug out unless it is of poor quality, in which case you may use gravel or any available suitable material. Remove any large stones. Compact the soil incrementally as you replace the material. 4. 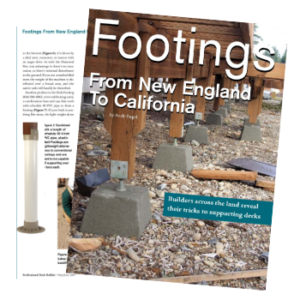 What is the size of the top of Redi-Footing? The top part (called “the cradle”) is 3 -1/2 inches wide. It’s designed to receive a nominal 4″ x 4″. Make sure the post or beam is in full contact with the horizontal space between the tangs and not resting on the top of the tangs. 5. Should the footing be just above the ground surface? You must bury Redi-Footing to the bottom of the cap. The schedule 40 (220 psi) PVC pipe is not UV stabilized and should not be visible above grade. If by chance the PVC pipe is exposed, you should apply paint to protect the PVC. Again, the PVC should be completely buried and the only aspect showing above ground should be the cap holding your 4 x 4 post. 6. What is the width of the base? Base width is 9.75 inches and suitable for most applications. 7. Does Redi-Footing meet code? Yes. Redi-Footing is code approved in Rhode Island and accepted by many local Building Officials throughout the nation. You can download the engineering test results to share with your building inspector and your local code requirements. 8. What’s the frost depth? Frost depth is the deepest area of the ground where frost will occur and varies depending on your region. 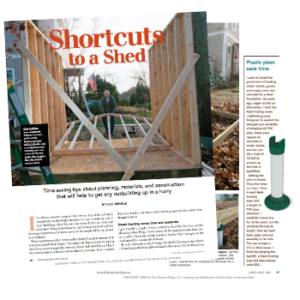 In Rhode Island, for example, code requires Redi-Footing to be buried a depth of 24 inches or 40 inches, depending on the nature and/or size of the structure. You’ll need to consult your Building Official for your local code requirements. 9. Can I use crushed stone at the bottom of the base? Also, would sand be a better backfill? Use the native materials that come out of the hole. Be sure to tamp firmly. The use of sand is not recommended. If soil conditions are a problem, you can amend the soil if you wish. As for the base, try not to disturb the soil beneath the bottom of the footing. Otherwise, you could use crushed rock or a bag of dry concrete. Always tamp firmly. 10. Do you have a cap that will permit 45 degree construction? No. Cut the timber at the angle appropriate to your installation so as to sit flat on the horizontal space between the cap tangs. Shim as necessary to achieve 100% contact with cap between the tangs. That is where all bearing weight should rest. There should be no weight on the top of the tangs. If you have questions, please use our contact form here or you can read more about Redi Footing here.